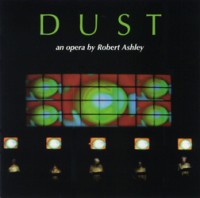 Dust, an opera by Robert Ashley and Yukihiro Yoshihara (video direction) whose imaginary setting is a street corner anywhere in the world, where those who live on the fringes of society gather to talk, to each other and to themselves, about life-changing events, missed opportunities, memory, loss and regret. Five “street people” recount the memories and experiences of one of their group, a man who has lost his legs in some unnamed war. As part of the experience of losing his legs, he began a conversation with God, under the influence of the morphine he was given to ease his pain. Now he wishes that the conversation, which was interrupted when the morphine wore off, could be continued so that he could get the “secret word” that would stop all wars and suffering.